The second edition of The Stonehenge Enigma, which is the first volume of Robert John Langdon’s epic trilogy Prehistoric Britain, is published today, revealing for the first time details of a six thousand year old map that lay partially buried in the ground that depicts the legendary island of Atlantis. The Slaughter Stone at Stonehenge is well known to archaeologists throughout the world. 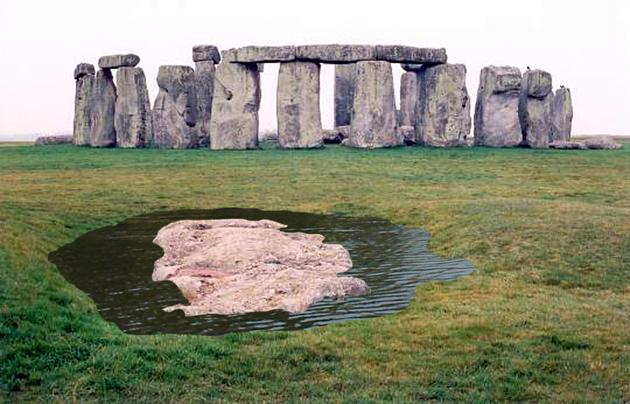 But what these experts have failed to appreciate is that this stone was deliberately placed in the ground by the builders of Stonehenge to represent a world that was flooded some 6,000 years ago by the rising sea waters. The book concludes that the entire Stonehenge monument was built in reverence to the lost souls of Atlantis, which lay not in the Mediterranean or between America and Africa as most historians believe, but under the North Sea in place archaeologists now call Doggerland. Robert John Langdon shows in his new book that two stones within the Stonehenge complex have been identified by geologists as ‘special’, because they are of a particular stone (Mica Sandstone) unlike all the other large sandstones on the site. Moreover, the stones are in a direct alignment to Doggerland/Atlantis, which is now known to have been inhabited some 10,000 years ago by an unknown civilisation whose tools have been found by oyster dredgers scraping the shallow bottom of the North Sea for the last one hundred years. Finally, the book also proves that the Atlanteans built Stonehenge as a monument to their lost island and dead (hence the term ‘slaughter stone’ we still use today), which was not a stone circle facing the Summer Solstice as portrayed by the Druids today. But as a ‘crescent moon’ facing the opposite direction and the midwinter sunset, as our ancient beliefs have always associated stone, the moon and night-time with the afterlife. A complete description and illustrations can be found on Robert John Langdon’s blog site at: www.the-stonehenge-enigma.info which has published the complete final chapter of this remarkable book including maps of Atlantis and the original diagrams of the Stonehenge temple to the Atlantean dead or by visiting his shop: Ology, 12-14 High St, Rottingdean, Brighton BN2 7HR were is housed a permanent exhibition of his books, models and illustrations.